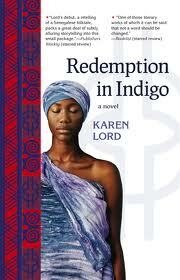 Like everyone else, I heard a lot about Redemption in Indigo when it came out, but, from its descriptions, it never really appealed to me. It’s a novel that’s told as a dizzying set of interlocking tales that are loosely based on Senegalese folklore. But I was well aware that the reasons I didn’t like it were somewhat racist. Fairy stories operate largely off nostalgia. No one remembers the first time they heard a fairy story. They were always just sort of…there. All tellings of fairy stories are retellings. And the fun in the retelling is seeing the variations: the ways that the teller has played with this thing that was such an essential part of your childhood. I am Indian-American, which means that my childhood contained a fair amount of European, American, and Indian myths and fairytales. So if you write a story about John Henry or Dhronacharya or Sleeping Beauty, then I’m there, I’m with you. My nostalgia has already kicked into gear and provided me that initial impetus to read your story. And if a fairy story riffs sufficiently well on something that I’m familiar with, then it doesn’t actually need to be that brilliant. It can coast pretty far on borrowed memories. But when your book is a retelling of the story “Ansige Karamba the Glutton,” then, well, I’m less excited. The pleasure you’re offering is a very different one. It’s the pleasure of being immersed in something entirely new. Which is great…but it’s not something I associate with fairy stories. Anyway, so with all of this in mind, I decided that I really ought to read Karen Lord’s book. Because, you know, my reasons for not reading it boiled down to, “I am not that excited about reading a fairytale that’s set in an African milieu.” Which is really not good enough. And it’s been pretty good! The first third or so was amazing! It was a very complicated and energetic story about a woman who’d returned to her home village to evade her awful, extremely gluttonous husband. I loved it. I was like, “This is such a brilliant and small-scale fable.” I loved the domesticity of it. A lot was at stake here, but the weights were all very different. I don’t necessarily like my stories to be all life and death. I prefer stories that’re about the home and about more small-scale conflicts. And I think the book did a really masterful job of adding that hint of loneliness that makes domestic conflicts into such a terrifying thing. Which is why I’ve been a bit less happy that the book’s taken a more large-scale turn. But even now, the Big Bad has an interesting bumbling quality. He’s obviously not capable of, like, conquering a kingdom. And he’s so riven with weird absences and petty emotions and minor anxieties. He’s a bit adorable, actually. I hope that things work out for the Indigo Lord.